After Mike's extremely poor attempt to get votes sent his way and play an idol, him and Joe appear to be sitting ducks for the seven to knock off over the next two votes. But the seven aren't as strong as assumed. Chrissy and Ryan already have plans to target Ben once they reach "the seven". Meanwhile, Lauren wins the Reward Challenge and chooses Devon, Ben, and Ashley to join her for burgers but also to create a new majority alliance to take control of the game. In the midst of all the scheming, there's a bit of a surprise: letters from home under a burger bun. That's where I usually leave my mail as well. 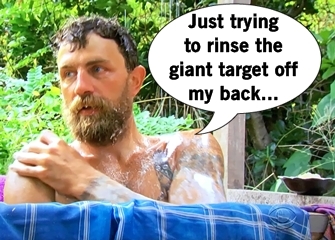 When Ben returns to camp to read his letter alone by himself, he stumbles upon a clue for a new Hidden Immunity Idol in a clay pot which he successfully finds. Time to shake up the seven. At the Immunity Challenge, Devon, Ben, and Lauren opt to sit out of the Immunity Challenge to chomp on some chocolate and peanut butter. The rest of the group balance on pyramids for their guaranteed safety, eventually won by Ashley. The seven gather to decide which of the Coco-nuts (Joe is Coco, and urologist Mike is the nuts) to vote off, with Chrissy saying to take out Mike first. But there's a different plan in motion by the new foursome to seize control. The plan: Ben will act as a double agent and vote for Mike with Chrissy, Ryan, and JP, but Lauren, Ashley, and Devon will bring in Joe and Mike to gain the majority and blindside the others. Oooh this is getting fun. Tribal Council time! Mike explains his idol play and rantings at last Tribal Council were not crazy and had a point. The newly formed comedy duo of Mike and Joe are two votes that can be used to anyone's advantage, should anyone take up their offer. But of course, Ryan says their pitch doesn't fit into the seven. 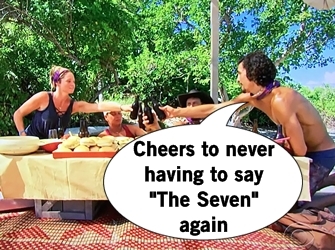 The "perfect storm" is coming per Lauren because the game ends with three, not seven, and they're not seven best friends sitting around a campfire together. It's all about being in the know on the plans and playing Survivor at all times. 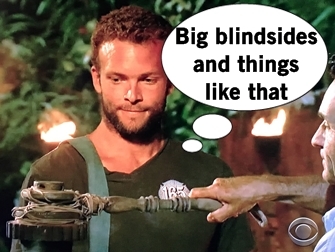 This conversations pans out beautifully when the big blindside happens and JP is voted out of the game, shocking Ryan and Chrissy who thought they had their checks signed, sealed, and delivered. So much for lucky number seven. But guess what, everyone? This recap isn't over because this is a TWO HOUR EPISODE! Shall we continue? The tribe celebrates/gloats to a dumbfounded Chrissy and Ryan about their move. Devon is ecstatic that he's running the game, which is either the confessional of a future winner or a guy who eventually gets screwed big time. Ben plays his role as infiltrator masterfully, pretending to be on the outs so Chrissy and Ryan think he's still a part of their alliance and making Joe and Mike believe he wasn't part of the plan either. It makes for an amusing reward of keeping up the ruse with Devon and Ashley fake-disliking Ben and Joe loving every moment of Ben being on the bottom. Desperate to re-gain the upper hand in the game, Ryan tries to talk game with Dr. Mike but gives him a hard pass since Ryan rejected his outreach before. Chrissy tries to tell Lauren her and Ryan have talked about taking her to final three and Lauren isn't buying it since Chrissy never once tried to align with her before. Oh how the mighty have fallen and it's so entertaining. Chrissy hates the feeling of having no control over her fate in the game, but turns that fate frown upside down by winning the wheelbarrow and puzzle solving Immunity Challenge. Ryan and Chrissy assume the votes will go towards Ben or Ryan, so Ryan plans to use the Hidden Immunity Idol he doesn't stop talking about to buy him three more days. They're totally unaware of the four's actual plan to finally vote out Joe under the guise that the votes are being split between Ryan and Ben, then utilizing Lauren's extra vote to get rid of Ben. 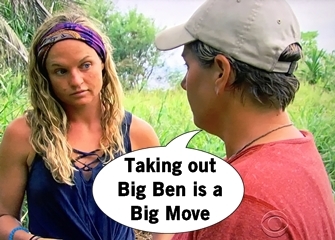 As Ben continues to ride high on both sides, Lauren and Ashley realize Ben's in the best position to win this game and considers that it might be advantageous to blindside Ben now. The idea is floated to Devon whose face lights up at the idea but is also torn which is a better move for their future game. Betrayal all around, this is getting good. Tribal Council time (again)! Chrissy's dream for sixteen years was to be on Survivor and winning immunity while at her lowest is a great feeling. Dr. Mike and Joe are all smiles too, finally feeling a part of the alliance. Ben says he feels he's going home and Ryan agrees, pointing out that the other side utilized Dr. Mike and Joe's middleman votes. Joe says there was never a seven and puts that all on "King Ben." Ben says Joe and Dr. Mike are the bottom of the five, but Dr. Mike explains there's equal sharing of information. Probst's analogy of the night is wiping a whiteboard clean with a new plan each time and Devon agrees. 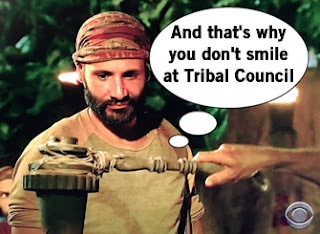 Not willing to let a Tribal Council pass by without one of his own heavy-handed analogies, Ryan compares Tribal Council to going to prom with one person and leaving with another. Nope, doesn't work. A smiling Joe admits this is the first time at Tribal Council he's felt comfortable, but the smile fades into a baffled grin when his "alliance" votes him out of the game.